Getting that perfect jersey can feel complex, at Artik we want to make it super easy for you. Call us or contact us and a dedicated staff member will reply quickly with personalized help. We offer hundreds of styles of baseball shirts, hockey jerseys, basketball tanks, football jerseys, soccer team jerseys, volleyball uniforms, rugby shirts, bowling shirts and sublimated biking team outfits. Browse our wide selection of sports uniforms and choose the perfect one for your team! Colours: The uniform should match your logo with it's colours and patterns, keep an eye out for uniforms with contrasting colours which can make your logo really pop! Material: The material of the team jerseys can vary as widely as the colours! Most of our jerseys are made from polyester knit or polyester mesh. Polyester uniforms don't absorb moisture or sweat which keeps them clean (no more febreezing your gym bag!). Polyester isalso perfect for adding screenprinted logos and vinyl cut player names and numbers. Practice or Game Jerseys: We recommend getting a set of practice jerseys, that way you can have practice on Wednesday before a game on Thursday and your team will show up clean and ready to win. Make Contact: Once you've chosen your favourite jersey style, we recommend contacting us to add names and numbers and order individual player sizes! Your sales rep will help you get everything ready to make custom sports apparel with your team names and numbers. Get Organized: Figure out each player's name, jersey size and team number. Note: We will only personalize uniforms that we have supplied. Stock Numbers: Just need basic numbers on your jerseys? We recommend using our 10" inch tall stock numbers. Choose from Black, White, Red, Golden Yellow, Royal Blue or. Vinyl Numbers: Vinyl letters and numbers can be printed with different fonts and sizes! Again, you can choose from Black, White, Red, Golden Yellow, Royal Blue or Navy Blue vinyl numbers. Adding Names: Names are always done in vinyl, they can be printed with different fonts and sizes. Especially long names can be fit onto the jersey. Adding your team's logo to jerseys is a great way to build unity and brand your team. Depending on the design of your logo, we will screenprint or do a vinyl transfer onto the jerseys. The cost and setup for each process varies based on size, number of colours and number of placements. We recommend contacting us with your logo and we will send a proof of the final jersey with a price quote. Artik Toronto is Your Custom Sports Jersey Supplier! Welcome to Artik! We're Toronto's custom sports uniform supplier. We'll print your player names and numbers on every player jersey. We've printed jerseys for thousands of teams, from beer leagues to pro teams. We print and embroider custom sports uniforms year round, from winter's hockey games to summer's bike races. At Artik, customizing baseball jerseys is our specialty! From youth leagues to professional baseball teams, we've printed jerseys for baseball teams at all levels. Our expert team will add your baseball team's logo, player names and numbers to each personalized baseball uniform. Living in Toronto, it's no surprise hockey jerseys are one of our top sellers! We've been custom printing hockey jerseys for over 30 years. If you need custom hockey jerseys for your next game or practice game, contact our staff. We're fast and friendly and we've got 30 years experience personalizing hockey uniforms with player names, numbers and team logos. Looking for customized basketball jerseys? Come to Artik! We've got over 30 years experience printing personalized basketball shirts, shorts and full uniforms. Contact our friendly staff, we'll make sure your custom basketball jerseys come out perfectly! Is your soccer team ready for some awesome uniforms? At Artik, we've got you covered. Check out our selection of customizable soccer uniforms and contact our team to add your player names, numbers and team logos. Personalizing football jerseys doesn't have to be complicated or expensive! At Artik, our experienced team will add your player's names and numbers to the back or sleeve of each custom football jersey, and we'll add your team's logo to the front. When you need custom football jerseys, come to Artik! Need custom volleyball shirts for your team? Come to Artik! 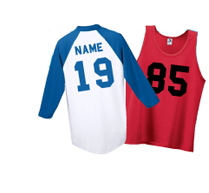 We'll print your logo, player names and numbers on your team's personalized volleyball jerseys. At Artik, we've got 30 years experience personalizing rugby shirts for Toronto teams. We'll print or embroider your design on rugby shirts and add player names and numbers on the back. Come to Artik when you need custom rugby shirts! Getting name printed or embroidered on a customized bowling shirt is simple and affordable at Artik. Our friendly sales reps will help prep your order and our expert embroidery and screenprinting team will create the perfect custom bowling shirts for your bowling team. Whether you're on a professional biking team, are participating in a charity bicycle event or run a spinning gym, Artik has the custom custom cycling uniforms you need! Browse through our catalog and choose the perfect bike shirts and shorts for you! Add sponsors, logos and your team's name to each bicycle uniform and you'll be ready to ride!